This project ended successfully on 14/7/2016 20:00! My name is Stéphanie, i m 37 years old and i m working for 12 Years in the fashion industry as area retail manager or consultant for known French brands. I did move to Basel 1,5 years ago to live with my partner who s a Basler architect . 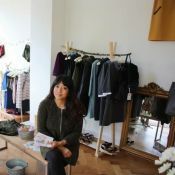 I did open my own shop in Güterstrasse 275 , so come over to visit me !